Germany has a real newcomer! After the Reggae landscape of this country has been dominated for years by Seeed and Gentleman (with constant streams of niceness from Sara Lugo, Sebastian Sturm, Uwe Banton or Ganjaman and occasional sound-mountains built by the likes of Mono & Nikitaman, Benjie, I-Fire or Spruddy One), a youngster by the name of Tóke is causing an earthquake that ripples reader-polls and stages alike. Now, a mere three years after he first spread his wings as a solo-artist, he releases his debut album called Wake Up Inna Kingston. For the ten tracks included, he teamed up with Italy's Bassplate Records; a well-informed decision, as you will hear! The riddims are fresh and interesting, and especially the brass sections will make lovers of hand-made music happy. Perfect introduction: with Frizzle, the artist takes us on a special sightseeing-trip through Kingston, a trip that is aptly illustrated by the accompanying video out since April. 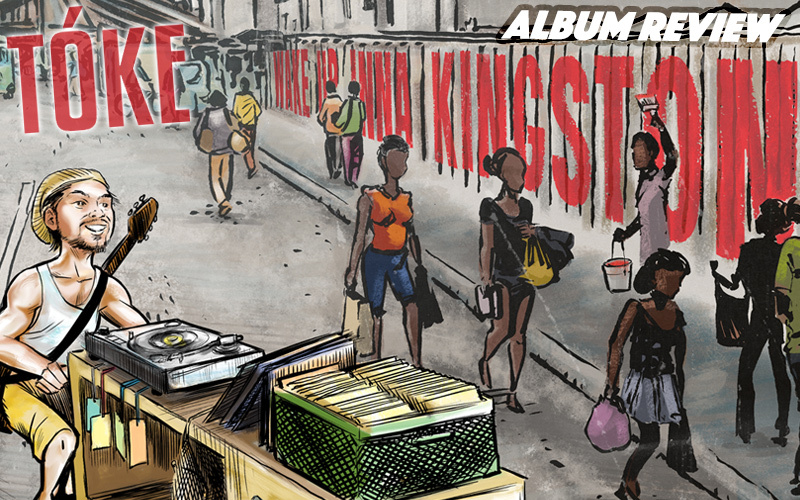 Torch, Chinna, Kazam Davis, Jesse Royal – the people mentioned and depicted in this track belong to the backbone of the roots culture of Jamaica's capital. While there, he obviously got infected with the Vinyl-Thursday-Fever, a highly contagious condition that is hard to shake off once it takes hold. Featuring EDB-founder and -teacher Exile Di Brave as well as the agile Infinite, Conscious Vibe brings across what's going on at Regal Plaza every Thursday, literally. Tracks like No One and Running Away remind me of the young Gentleman, and, like him 20 years ago, it's obvious from a song like Talkin Bout You that Tóke's voice has to mature a bit to reach its full power and potential. Mi Name, on the other hand, shows his already remarkable versatility, and at the same time brings across his congenial humour. The artist's Indonesian roots meet Indonesian roots artist Ras Muhamad in the next track. Open The World is a strong plea to shut the borders down and assist people who have to flee war and violence. Finally a reflection of the so-called refugee crisis in Europe, something I've missed so far in the international output of the last months! With Conkarah, Tóke invited another exceptional artist to the second feature Respect. It hails up all the hard-working people and calls for mutual respect: "There's no you and me, only unity!" Movements bears proof of the instrumental skills of the young artist. Tóke has mastered the guitar from a very young age, and most of his songs see the light of day accompanied to his own strumming and picking. In case you became a bit curious now, get the album. Or better still, come to Hamburg next week to see this newcomer live on stage at Kleiner Donner, where the release party of Wake Up Inna Kingston will take place!